The whole session lasted just 30minutes. 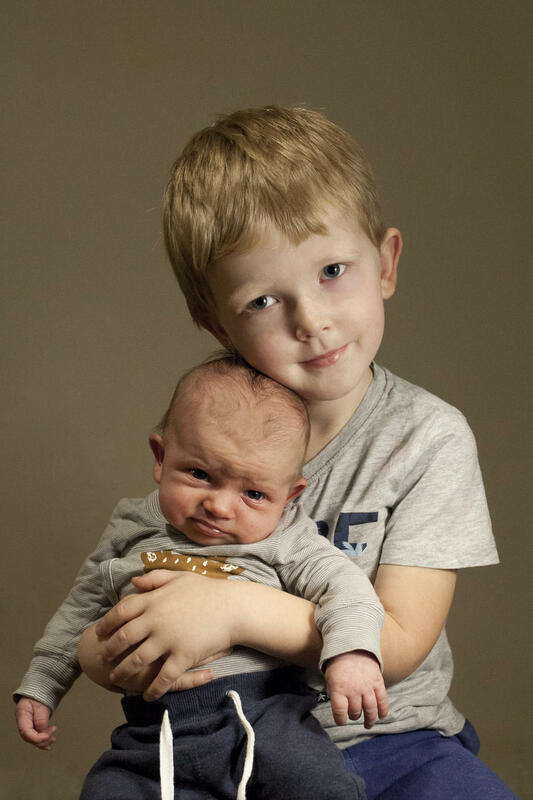 The goal was to get a photo where both of the boys look to the camera. The whole process was interesting because it was really tiny and dark room. We only had one tiny lamp which was pretty direct so we could easily redirect it if needed. We also had a big diffuser in between the models and the light which gave this nice smooth effect. Bigger boy was really good, keeping his little brother Herman (1 month old) nicely in his lap, supporting his head. Even tho he got sometimes tired, he fought until the end! Taking photos of children is always something different. To always have them looking in the camera, not crying and also getting the light into the eye is pretty hard! You have to bond with them, win their trust and make it interesting! 30 minutes is more than enough to get something nice and make them tired!